Although it would be good to find artefacts in pristine condition the reality is somewhat different. More often the items arrive broken, with pieces missing and rusting away. As Mike always puts it, "they'll have to go through the works." 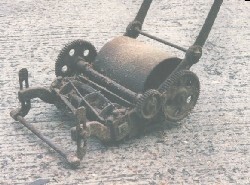 The mower was completely rusted and seized. 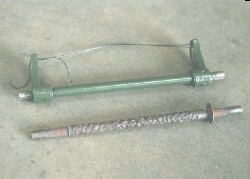 We renewed the gear shaft with a brand new replacement. The rear roller was completely overhauled. 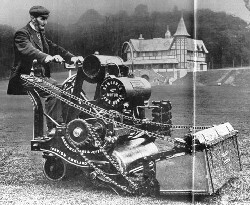 Whether small hand tools or three quarter ton mowers they all get the same treatment - some just take longer to finish than others. Then there is the other restoration project that takes years to complete. 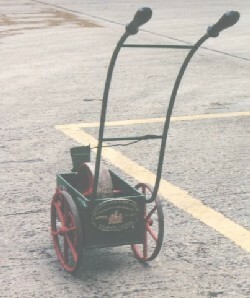 Ransomes sold its first 42" combination roller motor mower in 1902 to Cadbury's of Birmingham. 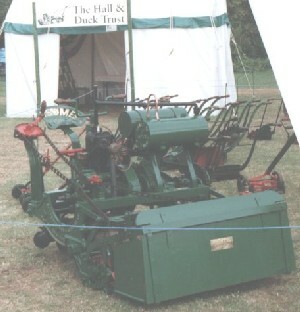 The photographs of this machine have been used in relentless marketing ploys by Ransomes ever since. 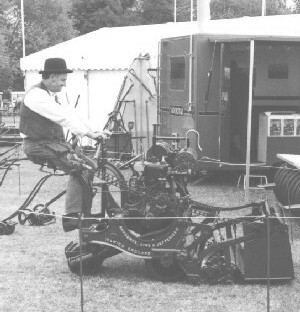 Thanks to Ransomes, Cadbury's World and Peugot Talbot we were able to track down the whereabouts of this famous machines only to find the the remains were in very bad shape. 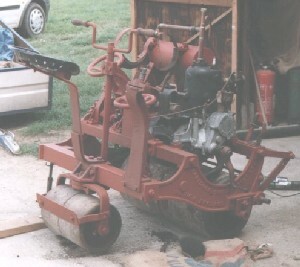 The cutting cylinder had been smashed off with a sledge hammer but still tied on with rope, the grass box assembly was missing, as were the drive chains, carburettor, magneto, and oil drip feed. 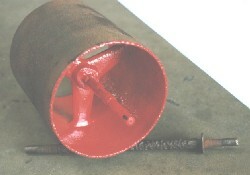 At some time in the past the radiator had been added to replace the original water tank. 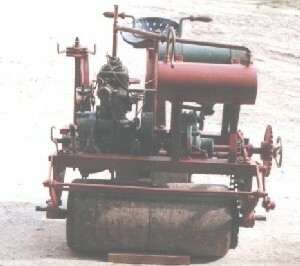 The original Simms engine had been replaced by Ransomes in 1904 with a Simms engine they had built under licence because the original was prone to seizing. We looked a the job long and hard before taking it on and and we have shut the door on it more than once. But the possibilities can eat away at you! The project took four long years to complete, the missing parts came from a wide range of donors - the Zenith carburettor from a 1904 Humber car and the magneto from another single cylinder car of the same period and were both found at the Beaulieu Autojumble. 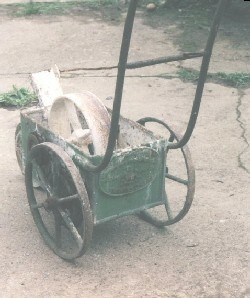 A period oil feeder came from an auction as did a Ransomes cast iron seat. Thanks to the skill of Andrew MacMorland the box assembly was refabricated from an original project he had undertaken some years ago. Andrew was also involved with removing the radiator, replacing the water cooling tank and putting the engine back into its original condition.